The beginning of the new year means governors are giving their annual state of the state addresses, celebrating accomplishments and outlining priorities in their states for the coming year. Speeches are scheduled to continue over the next few months, but some governors have already made bold statements to advance CTE. Indiana’s Governor Eric J. Holcomb vowed to re-configure and align existing workforce development programs with new initiatives in order to develop a skilled and ready 21st century workforce. This includes a promise to invest $2 million in a regional “Jobs Ready Grants” program to help current workers complete credentials in high-demand, high-wage fields. Additionally the governor plans to invest $1 million each year to better coordinate STEM education across the state. In South Dakota, Governor Dennis Daugaard applauded his state’s recent efforts related to CTE and dual enrollment. In 2016 the state awarded workforce education grants to help transform high school CTE programs, which resulted in new auto mechanic, precision agriculture and nursing programs. The state’s postsecondary Build Dakota program provided full-ride scholarships to approximately 300 students for a second year. Students in the program attend a technical institute in a high-need program and promise to work in that field in South Dakota upon graduation. Governor Daugaard celebrated the fact that while enrollment in two-year institutions is down nationally by 17 percent, enrollment in Build Dakota programs has increased by 10 percent. Wisconsin Governor Scott Walker discussed multiple workforce development initiatives his state has undertaken in recent years, including investments in the Wisconsin Fast Forward program, a grant program supporting employer-led programs for training workers. The state has also doubled enrollment in the Youth Apprenticeship program. Another investment has been Project SEARCH, which provides students with disabilities with targeted classroom support and internships. There are currently 18 Project SEARCH sites, and the state aims to increase that number to 27 by the next school year. Additionally the state has increased investment in the Wisconsin Technical College System, opening 5,000 more slots for students in high-demand areas. At the secondary level, the state has focused in the last year on investing more in college and career readiness planning and increasing access to dual enrollment options. Governor Sam Brownback of Kansas made quite a few statements regarding education in his address. Among more general promises to continue to build high-quality CTE programs and improving the state accountability system, he also encouraged the state’s postsecondary institutions to provide bachelor’s degree options for $15,000 or less. Additionally he announced plans to reform the state teacher certification and salary systems to attract more teachers to the state. In Colorado, Governor John Hickenlooper celebrated programs like Skillful and CareerWise Colorado, which help students develop new skills for new careers and have received over $15 million in grant funding over the last 18 months. He also held up the state’s work specifically in cybersecurity training, and the growing demand for more skills-based training. The state is facing a $170 million drop in education funding from property taxes this summer, which Governor Hickenlooper vowed to address. Tennessee Promise and Tennessee Reconnect were major features in Governor Bill Haslam’s address. Through Tennessee Promise, students attend community and technical colleges tuition free, and Tennessee Reconnect offers that same opportunity for adults already in the workforce. The governor also addressed plans to fully fund the Basic Education Program, which would provide an additional $15 million for CTE equipment. Register today for ourÂ newest webinar, where you can learn about state CTE policy trends around the country. Join NASDCTEc and the Association of Career and Technical EducationÂ on January 21, from 2-3 p.m. ET, as we unpack the findings of our third annual report, “2015 Year in Review: State Policies Impacting CTE,” which will also be released on January 21. Check out ourÂ 2014 and 2013 reports as well. And don’t forget to register for next week’s webinar on global competencies and CTE! 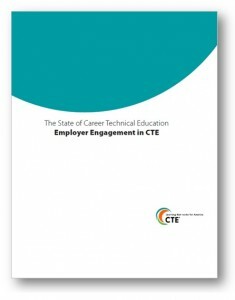 On January 13, from 3-4 pm ET,Â NASDCTEcÂ , the Asia Society, Longview Foundation and ACTE are co-hosting a webinarÂ to release our joint publication, “Preparing a Globally Competent Workforce Through High-Quality Career and Technical Education.” Local leaders will share what globally-minded CTE programs look like at the classroom level. As the 114th Congress officially starts this week, the nationâ€™s governors called on lawmakers to reauthorize long overdue federal education laws, including the Carl D. Perkins Career and Technical Education Act, Elementary and Secondary Education Act and Higher Education Act. The National Governors Association (NGA) held its third annual State of the States address on Tuesday in Washington, DC. NGA Chair and Colorado Gov. John Hickenlooper used the speech as a platform elevate important state issues regarding education, veterans, workforce development and more. Education was a focus of remarks from both Herbert and Hickenlooper as they both recognized that the key to a better skilled workforce starts with better education. Read the full remarks from both governors here. Just as Congress gets back to work, so are many state legislatures across the country. By the weekâ€™s end, nearly 20 state legislatures will have reconvened to tackle pressing issues affecting education, workforce development, and more. 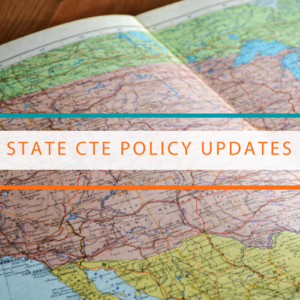 With much turnover at all levels following the November elections and many states still funding K-12 and higher education below pre-recession levels, NASDCTEc will be tracking CTE-related legislation across the country and keep you informed as it develops. Later this month, NASDCTEc and the Association for Career and Technical Education will publish ourÂ second annual â€œState CTE Policy Reviewâ€, covering major state CTE activity from 2014. Be sure to check out our Feb. 5 webinar â€“ register now! In case you missed our 2013 brief, you can get caught up here. Earlier this week, the National Association of State Directors of Career Technical Education Consortium (NASDCTEc) held its annual Fall Meeting, which had a strong focus on state policy. To lay out some of the major trends being led by legislatures, state agencies and state boards across the country impacting Career Technical Education (CTE), Amy Loyd, from the Pathways to Prosperity Network at Jobs for the Future, Jennifer Dounay Zinth, from the Education Commission of States, and Robin Utz, from the Office of Vocational and Adult Education (OVAE) at the U.S. Department of Education participated in the State Policy Update session. Dale Winkler, Associate Commissioner, Kentucky Office of Career and Technical Education, moderated the panel and opened by describing three major pieces of legislation passed over the last few years in Kentucky impacting CTE, strengthening the stateâ€™s CTE standards and accountability, pathways and governance. Jennifer Dounay Zinth provided an overview of cross-state legislation and governorsâ€™ agendas citing five overarching trends: career-ready performance indicators, governance structures to facilitate better CTE and industry alignment, finance through accountability and incentives, CTE pathways or industry-based credentials being embedded into high school graduation requirements, and greater coordination between K-12, postsecondary and workforce development/industry. Amy Loyd shared some highlights from the eight states working within the Pathways to Prosperity Network to better connect their education and workforce development systems to support more seamless student transitions. An early takeaway from that work is the importance of cross-agency efforts. The most successful states are those that bring together the major state agencies â€“ such as state departments of education, higher education commissions, workforce development boards, governorsâ€™ offices, and economic development commissions â€“ to develop common language, common goals and metrics, and even common funding as possible. Among the common themes that emerged as policy areas that still need more attention were dual/concurrent enrollment, credit transfer and articulation agreements, career guidance and counseling, and structures and incentives for more work-based learning experiences. During their State of the State addresses earlier this year, the majority of governors cited education and job creation as top priorities. A summary released by the National Governors Association, The Governors Speak: A Summary of the 2012 State of the State Addresses, found that nearly every governor that gave a State of the State speech this year said that job creation would be a major focus in 2012. Among the strategies for job creation were changes to tax codes, government processes, and regulations, and imÂ­provements to workforce training and education. College and career readiness was also mentioned by many governors as an education goal that is also tied to job creation. Other education priorities included accountability, local control and flexibility, and STEM education. More specifically, seven governors stated that they wanted to increase the focus on STEM to ensure that schools are providing skills relevant to careers. Additionally, 17 governors are proposing to either increase or maintain funding for education despite tight budgets.